The Patrol 301, Admiral Didiez Burgos of the Dominican Navy, docked Monday in the Havana port with more than 86 tons of aid on board to help the areas most affected by Hurricane Irma. Mercedes López Acea, vice president of the Cuban State Council, thanked on behalf of the State and the Cuban people the Captain of Frigate Macdonald Belliard González, commander of the patrol boat, the solidarity gesture of the Dominicans. She said that the donation is an expression of the Marti´s dream of unity in Our America and the common history created by Latin American and Caribbean peoples. We are brothers in the difficulties and with a relationship that is strengthened in the face of adversity, as in the lashing of Hurricane Irma to most of Cuba, said the vice president. López Acea reiterated the Cubans´ gratitude and said that Dominicans can count on the Cuban people to overcome any misfortune that nature imposes on them, which are sometimes complex and hard. 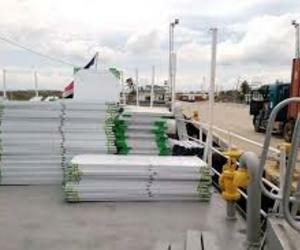 The Dominican military official said that the donation he has just brought to Cuba includes construction materials: wood, doors, aluminum carpentry, nails, metal roofing, wire and portable power plants. We came to the call of the authorities to bring this help, and we are proud to assist this brotherly people, it is a pleasure to be here in peace and as a sign of solidarity, Belliard Gonzalez told ACN. He said he was sure that if the devastation were in the Dominican Republic, Cuba would be the first to help, because relations between the two countries are historical and inseparable. Joaquín Gerónimo Berroa, the ambassador of that Caribbean nation to Havana, emphasized the solid union of the two countries, which was reaffirmed today with the simple gesture of solidarity, which considered little to the great demand of resources Cuba has to face the damages of Irma. This aid is little, we know that much more is needed, but if Cuba has something is the determination, courage and will to fight of its people against all adversities; and with that victory is guaranteed, concluded the diplomat.